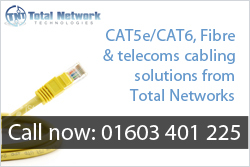 Total Network Technologies provide CAT5e and CAT6 structured network cabling installations backed by a 25 year manufacturers warranty for total peace of mind. Fibre optic cabling solutions, both singlemode and multimode, presented in a range of connectors. All new fibre optic installations are backed up a 25 year warranty. Has your network patching grown out of control and become unmanageable? 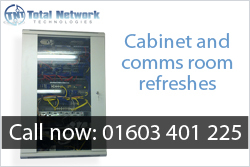 Total Networks provide a complete comms room refresh solution to help you regain control. 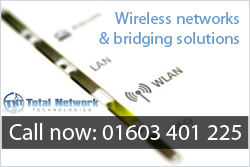 Industry leading wireless networks and wireless point to point bridging solutions from Total Networks. Total Network Technologies specialise in the design, installation and maintenance of structured voice and data networks. 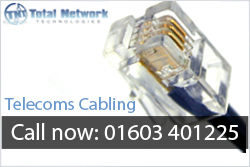 We provide CAT5e & CAT6 network cabling, fibre optic cabling, wireless network solutions, and Audio/Visual (AV) cabling. 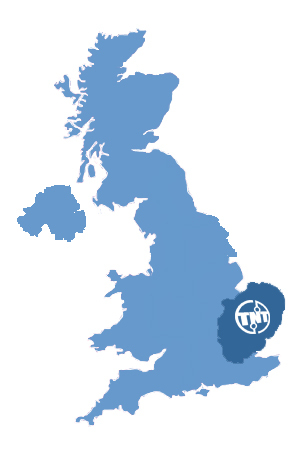 We are based in Norwich, and serve the whole of East Anglia, including Norfolk, Suffolk & Cambridgeshire. We have teams of highly qualified and knowledgeable network cabling installation engineers that have decades of combined experience, whom we guarantee will provide the highest possible standards of workmanship. In addition to CAT5e and CAT6 structured cabling installations we also provide network testing and troubleshooting services for faulty or problematic computer data networks. Total Networks install and maintain wireless networks. From a single access point or router for wireless internet access to site wide wireless networks spanning multiple VLANs. Total Networks have also installed many wireless bridges in a wide range of locations and scenarios. Modern wireless bridges can create a robust connection between remote buildings over great distances at surprisingly high speeds. Over time many comms cabinets can become unmanageable. Constant re-patching by different members of staff, with any leads that they may have to hand just to get network devices patched in can leave a ‘knot’ of cabling that is very difficult to work with. Total Networks provide a complete cabinet refresh & tidy service, click here for further information. Total Networks have been providing fibre optic installation services from Norwich, Norfolk, to all over the UK for more than a decade. 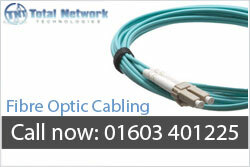 We install singlemode and multimode fibre optic cabling which can be terminated and presented in a number of different fibre connectors including LC, SC and ST.
Total Network engineers can professionally and aesthetically install additional telephone cabling and socket wiring throughout your business premises. From simple telephone extensions to large site-wide multicore voice cabling projects, Total Networks have the solution for your business. 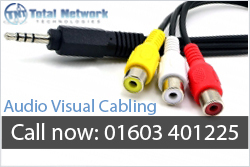 Total Networks provide Audio Visual (AV) cabling solutions to businesses. Solutions include HDMI, USB, Component, Composite, SVGA, Satellite, Speakers and much more. All AV provisions incorporate high quality printed circuit boards and components, installed by our professional engineers. What areas do Total Networks cover? Acle, Attleborough, Aylsham, Caister, Cromer, Dereham, Diss, Downham Market, Fakenham, Gorleston, Great Yarmouth, Harleston, Hingham, Holt, Hunstanton, King’s Lynn, Loddon, North Walsham, Norwich, Rackheath, Reepham, Sheringham, Stalham, Swaffham, Thetford, Watton, Wells, Wroxham and Wymondham. Aldeburgh, Beccles, Brandon, Bungay, Bury St Edmunds, Clare, Dommoc, Eye, Felixstowe, Framlingham, Hadleigh, Halesworth, Haverhill, Ipswich, Kesgrave, Leiston, Lowestoft, Mildenhall, Needham Market, Newmarket, Orford, Saxmundham, Southwold, Stowmarket, Sudbury and Woodbridge. Chatteris, Fulbourn, Godmanchester, Hanley Grange, Huntingdon, March, Northstowe, Peterborough, Ramsey, St Ives and St Neots.